And so my month of giveaways comes to a close. If I look around my house, I'm sure I could find another couple dozen books to giveaway. I hope you've enjoyed learning about these books as much as I've enjoyed sharing them with you. 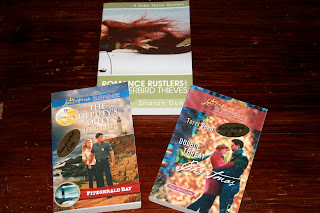 Today I have two Love Inspired Suspense titles from Terri Reed. And Sharon Dunn has included one of her full length titles Romance Rustlers & Thunderbird Thieves. I love the way she mixes humor into this series. I hope you'll participate one more time. It's been fun to meet so many of you this month. Now too the end of the year is here and we will have a bright new Year tomorrow with all the possibilities and hopes that always brings. I look forward to another year of reading good books and meeting a lot of authors by blogs and the internet. No I generally don't make new years resolutions because I always end up forgetting what I resolve to do. I really need more really good books to read. I make the same resolution every year, have since I was 12, and I have kept it faithfully for over 12 years. My resolution is to not make any resolutions. I don't make official New Year resolutions but I do have a few on-going goals that I am hoping to meet this year. I do NOT make new years resolutions, however, this year I have 4 goals that I want to work on and be successful at. My first and most important goal is to read God's word more and pray more often. I feel I do fairly well in this area already but I haven't done my best. God deserves the best I have to offer not my leftovers! No, I don't really make resolutions. I used to, but I never accomplished them. Now, I usually have a couple of goals that I'm working toward, and I may re-evaluate them at the New Year, but that's about it. Happy New Year, and thanks for the giveaway! I usually make resolutions, but I am bad at keeping them. So I didn't make any this year. Thanks for having the giveaway. I don't usually, but this year I've resolved to find a job. My New Year's resolution is to exercise more. Thanks for the giveaway. No, no resolutions for me. No formal resolutions for me...but I do try to take advantage of the 'fresh start' to purge some clutter, re-commit myself in personal disciplines, etc. I usually don't make one. Christmas Giveaway Day 9: Suspense! Christmas Giveaway Day 8: Romance! Where is God in Tragedy?